The guitar Bob Dylan played on his first electric tour—a black 1965 Fender Telecaster owned by Robbie Robertson—has gone through myriad changes throughout its historic life. 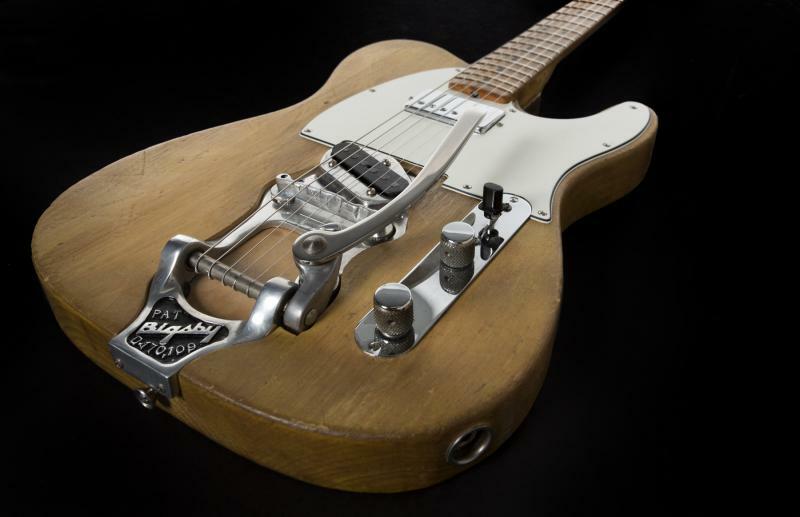 Today, having long been stripped of its black finish, re-routed for a humbucker in the neck pickup position, and equipped with a Bigsby tremolo, it sold through Julien's Auctions for $490,000. While much of the press leading up to today's sale called the instrument Dylan's "going electric" guitar, that is not entirely accurate. Dylan famously used a sunburst Stratocaster for his first electric show at the 1965 Newport Folk Festival, five days after the release of "Like a Rolling Stone." When that Strat sold at auction in 2013, it went for $965,000—making it one of the most expensive guitars ever sold. That said, the Tele sold today has plenty of historical significance. It was the guitar Dylan wielded during his first electric tour, a contentious run that saw Dylan and The Band (minus Levon Helm) pummel their at-times hostile audience members, who booed, called Dylan "Judas," and generally didn't appreciate what they were witnessing. Dylan soon used the Tele again during the recording of Blonde On Blonde, while Robertson would later play it throughout The Band's career—using the guitar on classics like "The Weight" and "The Night They Drove Old Dixie Down" from Music From Big Pink and The Band. The guitar was also played by Robertson and Dylan during the recording of The Basement Tapes in between the electric tour and The Band's own work at the rented Woodstock, New York, residence. Today's Music Icons auction also saw guitars from other legendary artists go under the hammer. A 1968 Fender Rosewood Telecaster owned by Elvis Presley had a winning bid of $115,200. A prototype of Kurt Cobain's half-Jaguar/half-Mustang "Jagstang" sold for $93,750, and the remains of an Aria Pro II Cobain smashed at a Nirvana concert sold for $81,250. George Harrison's first electric guitar, a Hofner Club 40, was another expensive item, which ultimately sold for $430,000.